Description: The Mace tree may reach heights of about 65 feet (20 metres). They yield fruit eight years after sowing, reach their prime in 25 years, and bear fruit for 60 years or longer. The nutmeg fruit is pendulous and similar in presentation to a peach. When fully mature, it splits in two, exposing a crimson-colored aril. This is the mace which surrounds the nutmeg pit. Mace is a vibrant red-colored seed husk covering (aril). Common Uses: Mace Essential Oil has been used as an analgesic, anti-emetic, antioxidant, antiseptic, antispasmodic, aphrodisiac, carminative, emmenagogue, larvicidal, and as a stimulant. 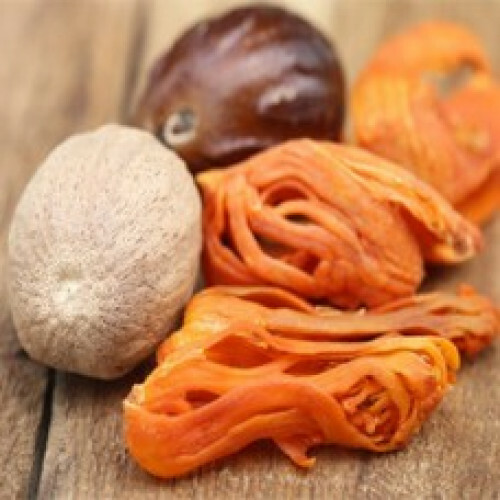 Aromatic Scent: Mace Essential Oil has a medium, spicy scent reminiscent of nutmeg.